PFLAG National has released an online resource for chapters and individual members interested in reaching out to faith communities. The PFLAG Faith Field Guide has a new, constructive tone, unlike the “us vs. them” tone of previous materials. The new emphasis encourages individuals to approach faith communities constructively, creatively, and personally. Below are a few paragraphs that typify the new attitude toward faith communities. Chapters are encouraged to 1) establish a position devoted to faith community issues, 2) have people from a variety of faiths available in our Speakers Bureaus, 3) think about one-to-one pairing of PFLAGers and new parents who share the same faith background, 4) include in our chapter’s newsletter articles about faith, and 5) move out of our comfort zones when it comes to which religious groups we work with. • Elect a faith representative. Create a position within your chapter to specifically focus on faith issues and their role within the chapter and community. • Have people of faith in your speakers’ bureau. This helps make your chapter more welcoming, provides a great way to reach out to faith communities, and helps educate PFLAGers about faith issues while educating people of faith about LGBT issues. Try to get speakers from different faith communities. • Consider pairing up people with similar faith backgrounds for one-on-one support. Some people are more likely to open up outside of the support circle. Pairing them with an experienced PFLAGer from a similar faith background may make them feel more comfortable. • Include articles in your newsletter about faith. Including an article or even devoting a regular column to faith in your newsletter is a good way to keep people informed about the latest news and issues. The articles can be news stories or personal stories where guest columnists (from within your chapter or the community) share their stories of coming to terms with their faith and having a LGBT loved one. Again, be diverse in who writes the story and the perspective they share. • Move outside of our Metropolitan Community Church and Unitarian Universalist comfort zone. When reachingout to faith communities, remember to look beyond the usual suspects. There are lots of congregations that are welcoming or are looking for ways to become welcoming. Working with PFLAG can be an easy way for them to get started. PFLAG parents who love and accept their children have much to offer faith communities. Sometimes we are invited to present to congregations as part of their O&A process. Our Speakers Bureaus can offer panels to congregational Peace & Justice committees, elder boards, and various other committees. As individuals we can become friends with pastors, even in denominations that seem unlikely. For various reasons, pastors are encouraged to make contacts with members of the community. While many pastors have their minds made up, others are more reflective than others, and are genuinely open to input that is dissonant with their religious culture. For example, there is a lot of soul-searching going on among some conservative pastors because of Pastor Worley’s outrageous suggestion that gays and lesbians be placed in electrified compounds, fed via airborne food-drops, and left to die off. On one Southern Baptist discussion thread, a young southern pastor posted this question: “What should be our response to gay hate speech from the pulpit?” He was taken to task by another Southern Baptist for using the words “hate speech.” He was criticized for using a phrase used by liberals to prevent free speech. But there is a Southern Baptist pastor posing a truly probing question to his pastoral colleagues. 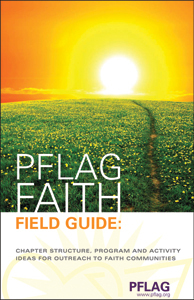 The PFLAG Faith Field Guide is an excellent resource for chapter around the country. Hopefully it will generate internal conversations, and allow us to reconsider the habit of holding faith-related matters at arm’s length. Many cultural, political, and legal hurdles are being dealt with effectively. Much of the future progress a matter of demographics. As faith communities struggle with ideological and organizational conflict, PFLAG members can be a great help. Not everyone will be inclined toward this task. People who have unprocessed anger and hostility might not be the best ones to engage faith communities. Nevertheless, the PFLAG Faith Field Guide provides excellent direction for those inclined to engage faith communities with patience and care. This entry was posted in PFLAG. Bookmark the permalink. I like the change in tone, it is much more constructive – relationship building is a better way to go.